This german work in progress online book is oriented towards the latest stable or development releases of Gambas. Articles are accompanied by full and explained/commented projects. Download links for the entire article as a PDF and the treated project's source code are to be found at the end of each page. Readers are encouraged to participate with corrections and their own projects. An English translation of the German Gambas-Buch introduced above. Start reading the English version at http://www.gambas-book.net. An electronic book written by Willy Raets (with a contribution of Graham Wilson). This part covers the different installation methods of Gambas 3. 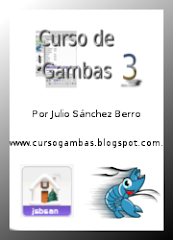 Download the book (in pdf format) at How To Gambas - Installing Gambas. More information on the project in general at How To Gambas web site. An electronic book written by Willy Raets. This part covers the building of simple standalone GUI applications. Aimed a people new to Gambas 3. Download the book (in pdf format) at How To Gambas - Building GUI Applications. The following books all talk about Gambas 1.0! A spanish book written by Daniel Campos & José Luis Redrejo, with a foreword by your servant. This is an indonesian book about Gambas. A wiki book on Gambas, located at http:/en.wikibooks.org/wiki/Gambas.